To provide you extra security , all the windows operating systems ( Windows xp , Windows vista ,Windows 7 ,Windows 8 ) come with a virtual On-Screen keyboard feature . The virtual On-Screen keyboard in Windows is a very handy little feature which can be of great help when you are facing keyboard troubles . Reason 1: Your keyboard is malfunctioning or the drivers have gone corrupt . Reason 2: You get extra security while typing your login details online , as its very much impossible for key loggers to capture your Virtual keyboard strokes . Reason 3: You can use the virtual keyboard on touch screen devices . According to your requirement you can put the virtual On-Screen keyboard on your Windows PC into many uses . Although the most practical use of the virtual On-Screen keyboard can be while entering login details for various services , when you are accessing them from other people’s computers and devices . Method 1: Accessing the virtual On-Screen keyboard from start menu . To access the Virtual On-Screen keyboard , simply click on the windows start button and type in “osk” in the search bar and press enter . Now the On-Screen keyboard will pop up on you screen . Method 2: Accessing the Virtual On-Screen keyboard from Accessories . 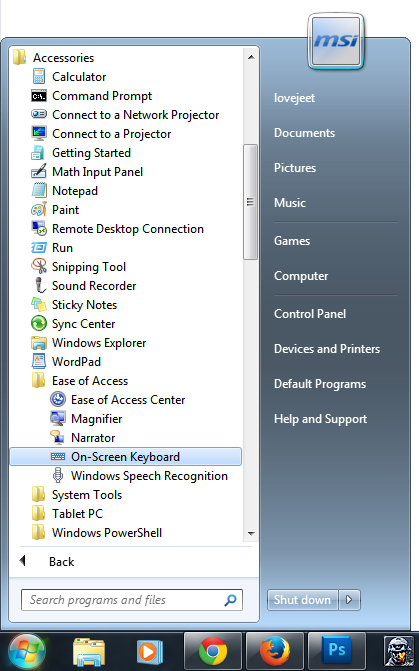 By default you can access the Virtual On-Screen keyboard from Accessories under the Windows Program menu . To access the On-Screen keyboard just navigate to Start menu > All Programs > Accessories > Ease of Access > On-Screen Keyboard . Whenever you are logging into any of your Online services from another computer , always prefer to use the Virtual On-Screen keyboard in Windows . 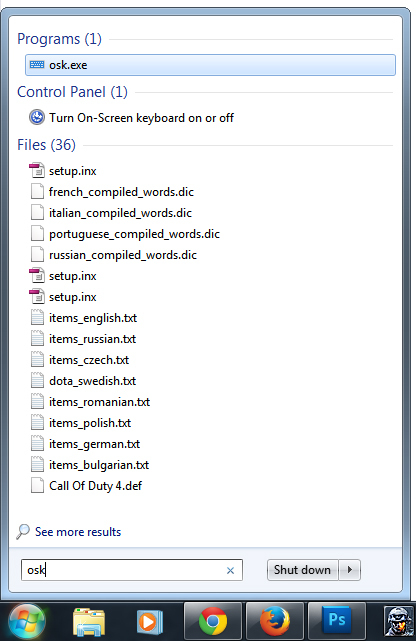 Apart from the On-Screen keyboard in Windows , there are many other Virtual keyboard programs available which come with different keyboard layouts . In case your keyboard lacks a certain character , you can always download and use any of these virtual keyboards . Further today there are project-able virtual keyboards available in the market , which project the keyboard layout on any surface and you can use them just as you use a normal keyboard .